When you talk about pickup trucks, you really think of the west. The pickup truck is like the horse and wagon of the old west. It is the work horse of the farm or the ranch. With a pickup truck you can do a variety of different things, so it is a multi purpose vehicle. You can haul cargo to where ever you need it and if you have a king cab, then you have the limo of the west and people and cargo can get around at the same time which is great if you are on a job site. But What Do You Do When The Truck Starts to Have Transmission Problems? You find a transmission repair shop in Albuquerque NM, of course. Why do you want to go to a specialist up front? Well, it will ultimately save you a bit of time and money, surprisingly. Most auto shops don’t have any facility. They outsource the transmission job to an external shop. That adds a bit more to your labor charges. Taking your truck in to a transmission expert however will help you in the long run. A truck is perfect for farm and ranch use. It is not as bulky as say a semi, but if you equip it correctly, it can be a very nice vehicle to have. So take care of your truck. If the truck get mud all over it, give it a bath and wash the mud off. Make sure to check the tire pressure and keep the tires filled to the correct pressure. It will pay for itself if you take care of your pickup truck. Now let's talk about a 4x4 truck or sports utility vehicle for a bit. Now with the 4x4 you have some extra issues that you need to be aware of. Let’s start with your transfer case. A transfer case is, in a way, almost like an extra transmission for four wheel drive vehicles. A transfer case is component that is part of the power train of four-wheel-drive and all-wheel-drive vehicles. Drive shafts connect the transfer case to the transmission. The transmission generates the power, and the transfer case sends the signal to both sets of axles. While it can be gear-based, most transfer cases are chain driven. While a lot of transfer cases are automatic, some can be controlled manually by the driver, often with the flick of a switch. This is very important with off-road vehicles where greater torque is necessary. One thing that you want to do is to regularly service the transfer case. This should be done between 15,000 and 25,000 miles, this is what the manufacture recommends. Most pickup trucks nowadays are automatic transmission based. Usually it is only vehicles designed specifically for off-roading that have manual transmissions or five speeds. A pickup truck’s automatic transmission has to work perfectly with a transfer case, or otherwise you run the risk of damaging both components, or have a much rougher ride than you might be expecting. If the transmission is what sends power to the transfer case, then that part needs to be service just like the transmission. 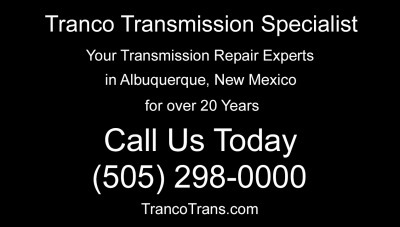 You need to find a great transmission repair shop in Albuquerque, which is Tranco Transmission Specialist. Most of the repair shops that end up have to work on a transmission and are not equipped to do that type of work send it over to Tranco. You should call them at (505) 298-0000 and schedule an appointment today if you suspect transmission or transfer case problems with your truck or 4x4 utility vehicle.